Assists companies with interests in commercial collateral and off-site assets in verifying the physical location and condition of their asset(s). Provides customized solutions based on industry type and assets to be verified. Offers dedicated project manager who works closely with clients to develop and employ strategy, making asset verification as seamless as possible. inspection provider with an understanding of the industry-specific concerns and a national network of well-trained, vetted professional inspectors. 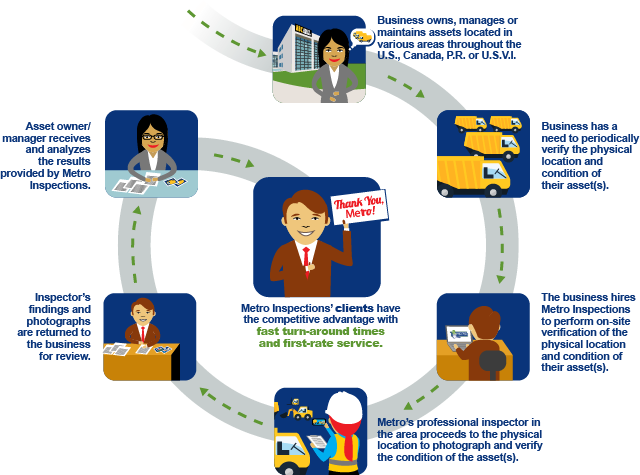 Metro Inspections will assign an inspector to visit the business location and review the condition of the collateral, take pictures and even validate serial numbers on equipment. Then we analyze, scrutinize, and compile the results in order to submit them to our client through our state-of-the-art Inspection Management System. The lender/lessor is then able to assess the findings as they determine how best to manage their credit and portfolio-level exposure.